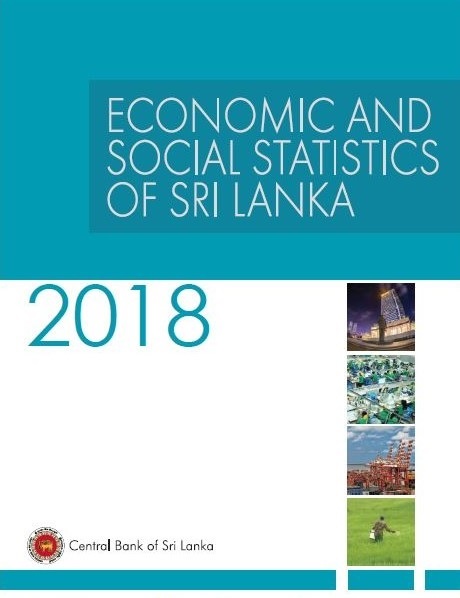 The 'Economic and Social Statistics of Sri Lanka - 2018' an annual publication of the Central Bank of Sri Lanka, is now available for public access. This publication contains economic and social indicators of Sri Lanka in the areas of national accounts, agriculture, industry, external trade and finance, government finance, banking and financial institutions, money and capital markets, prices and wages, population and labour force, transportation, education, health, telecommunication services, climate and selected information on economic and social indicators of other countries. In addition, information on living conditions, poverty and household characteristics in Sri Lanka from Household Income and Expenditure Survey (HIES) conducted by the Department of Census and Statistics is also available in the publication. Further, it includes disaggregated information at the provincial level on key economic variables. The statistics in this publication have been presented in time series / cross sectional basis to serve the diverse needs of users, such as entrepreneurs, policy makers, researchers, teachers, students and the general public. The publication can be purchased from the Sales and Distribution Counters of the Central Bank at its Central Point Building (Chatham Street, Colombo 01), Centre for Banking Studies (No. 58, Sri Jayewardenepura Mawatha, Rajagiriya) and Regional Offices of the Central Bank (Matara, Matale, Nuwara Eliya, Kilinochchi, Trincomalee and Anuradhapura) and the Electronic version can be accessed through the Central Bank website (http://www.cbsl.gov.lk).